Step 1.Design an image you want by using computer design software. Step 2.Using a plotter machine ,cut in mirror image. Step 3.Weed the useless film around the image. Step 4.place the front image in the place where you want to transfer on the garment. Step 5.Set a heat press machine from 150°C(302°F）to 160°C（320°F). Step 6.Press it only for 5-15 seconds at medium pressure. Step 7.When it is hot,remove the polyester backing film. Note:Due to the diffference between different monitors, the picture may not reflect the actual color of the item. Thank you! FEATURES:Wear resistance, alcohol resistance, high temperature resistance, acid resistance, alkali resistance, strong adhesion, high elasticity, do not fade. VIEW EFFECT:In the day time: White,In the dark will look like Blue. 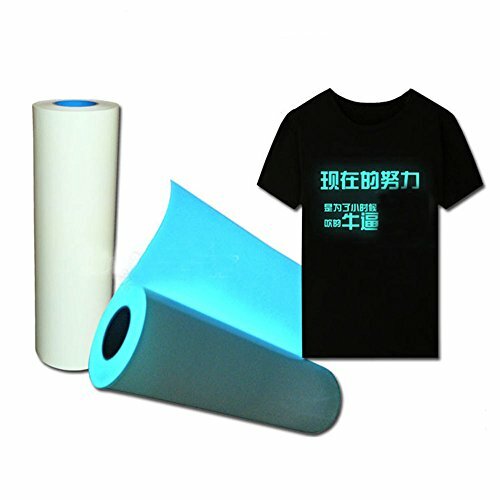 DIY YOUR CLOTHES:DIY the parttern for your Garment.Luminous heat transfer film to accept the light source irradiation time longer, the greater the intensity of light, the stronger the luminous intensity in the dark. OPERATE TEMPERATURE:Stamping temperature: 150-160 degrees;Stamping time: 8-12 seconds.Tear film time:Hot tear. USAGE:Suitable for number of sportswear bags, hats, pillows, shirts, T-shirts, polos, arts, crafts and other decorations.Fire safety signs, ship safety signs. General orientation, instruction, identification mark.